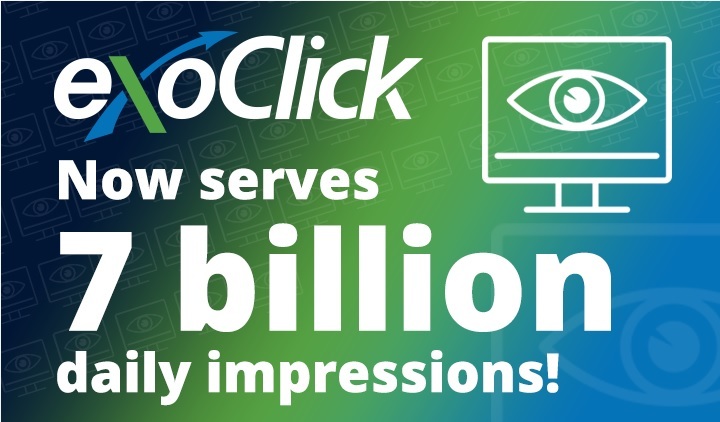 ExoClick has announced it is now serving seven billion daily ad impressions across its global ad network of publisher sites. “I think there are several factors that have contributed to this significant growth in impressions. “Firstly, regarding Google, we were quick to introduce a new range of compliant ad formats whilst educating our publishers and advertisers on how to continue to maintain their revenues and stay compliant. We introduced a new Google compliance system for publishers so they could block non-compliant ads with just one click in our admin panel. “We promoted Evangelos Ziridelis to Sales and Ad Operations Director who implemented many platform improvements, optimisation tools and re-shaped how we now manage sales. “We have been steadily growing our exclusive members area and email dating traffic with new deals. Both our In-stream video and Native ad formats have seen spectacular growth. “We launched the Push Notification ad format back in October 2018 and in the last 30 days have added 10 million new users. “Our RTB team are now managing over a billion daily RTB events for both supply and demand. This latest milestone means ExoClick has seen its number of ad impressions grow by 75% since 2014. Visit the ExoClick website here.